there is a restaurant in my hometown that serves creme brulee bread pudding. it is in fact one of the best desserts i have ever had in my life...in.my.life. 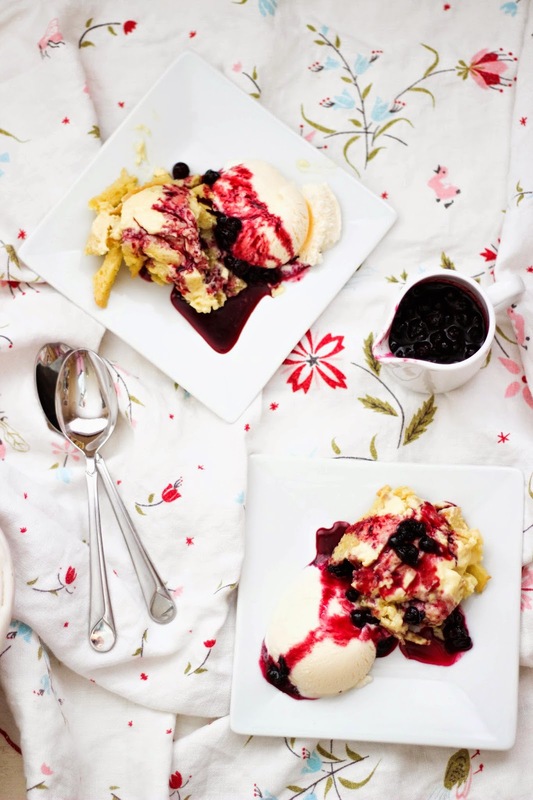 when i was home for spring break, my friends and i went there to get said bread pudding and much to our dismay they were out of it for the night. i then spent the next two days trying to get my hands on this delectable treat but it slipped through my fingers. so alas, pam and i took it upon ourselves to whip this sucker up. and bailey nash if you read this, my fellow creme brulee bread pudding lover, it is pretty damn close. i mean, it's not exact of course, but sometimes you want a whole pan not just a single serving, so. i would also like to mention in this segment of this post that pam kincaid is a kitchen cookin' fiend and her talents should be shared with the world! the world, pam! pam has recently taken a liking (borderline obsession), with ree drummond (aka the pioneer woman aka pam and i just call her ree like we've known her for years) she watches her show, researches her life on the lodge, purchases products because ree told her to, etcetera. she even sometimes calls me to tell me "what ree is cookin' up today." once pam said to me that she too would really like to have her own cooking show. i encouraged her, explaining that a simple cooking blog could be just the thing to keep pam inspired but she will have none of it. she tells me that she "isn't a good writer" and that "she would get nervous" damn it, pam get it together! you are an amazing cook and a snappy dresser with an adorable personality to boot. this is my rally for anyone who reads this blog and happens to know pam to make her start a food blog! pamcakes! 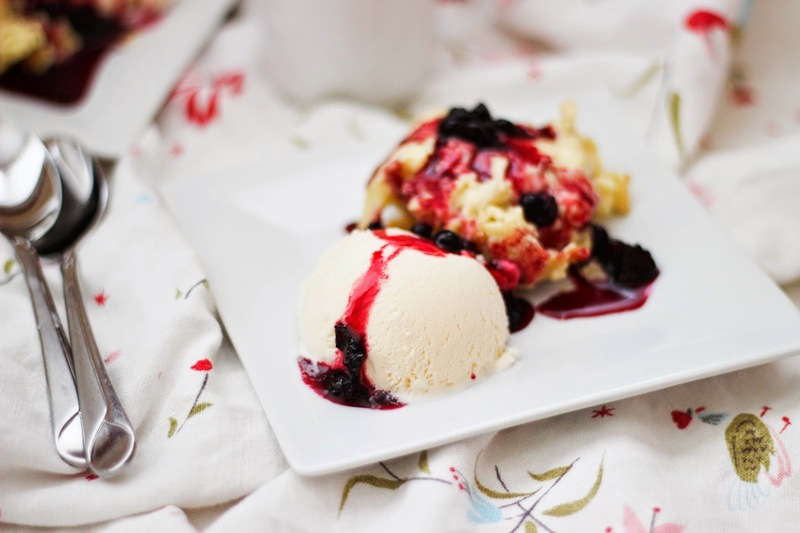 the blog can be called pamcakes! i digress. and now for the bread pudding, which surprise! we used with one of ree's recipes to create this. 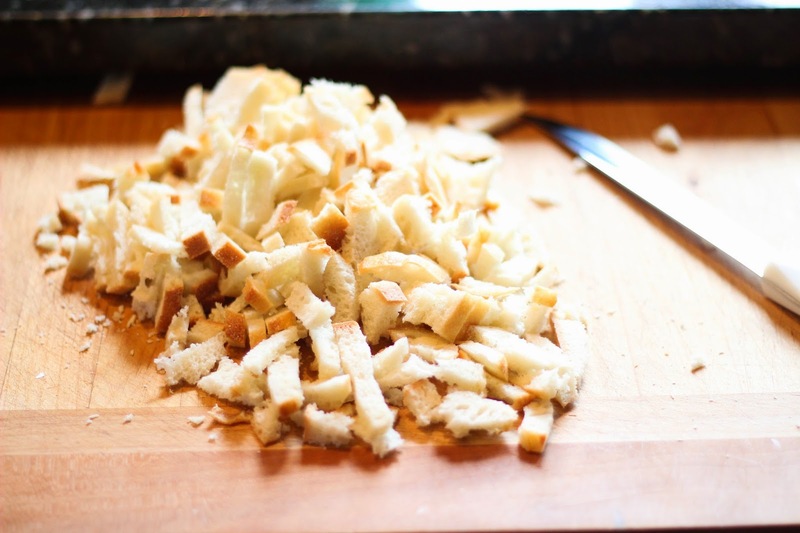 start my chopping up your bread in very small chunks, if when i made this again i would probably go even smaller than the chunks you see here. i used a mini loaf of day old french bread which made about 4 cups of chopped bread. 1. heat the cream and the vanilla in a saucepan over medium heat (we used a cast iron because duh, that's was ree uses.) stir almost constantly until the cream is just about to a boil (you can tell when the cream starts to form tiny bubbles just under the surface) and then turn off the heat. 2. in a large bowl add the egg yolks and sugar. whisk the mixture as fast as you can for 2-5 minutes, or until it is very pale and light in color. 3. now, drizzle a bit of the warm heavy cream into the egg mixture to temper the eggs. you need to do this so that the eggs don't scramble. slowly continue to add the cream, whisking quickly. once the eggs are tempered, you can add the cream more quickly. 4. in an 8 inch square pan add the chopped bread and pour the creme brulee custard over top. 5. place the pan on a deep baking sheet and set it in the oven. next, pour hot water into the cookie sheet (this helps the custard bake). then bake for 30-35 minutes at 325 degrees or until the custard looks fairly set. 6. let the pudding cool and then refrigerate for at least 2 hours so the custard can set. 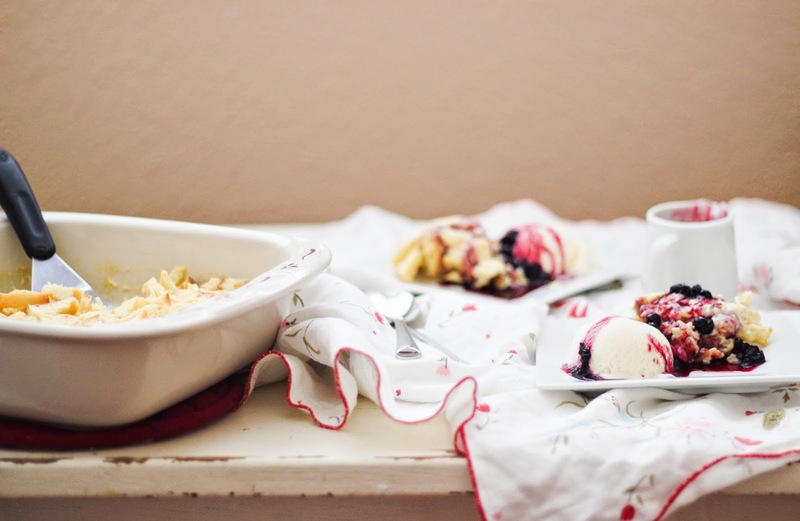 in the meantime, you can make huckleberry sauce for the top of the creme brulee. well, you can really make any kind of berry sauce. 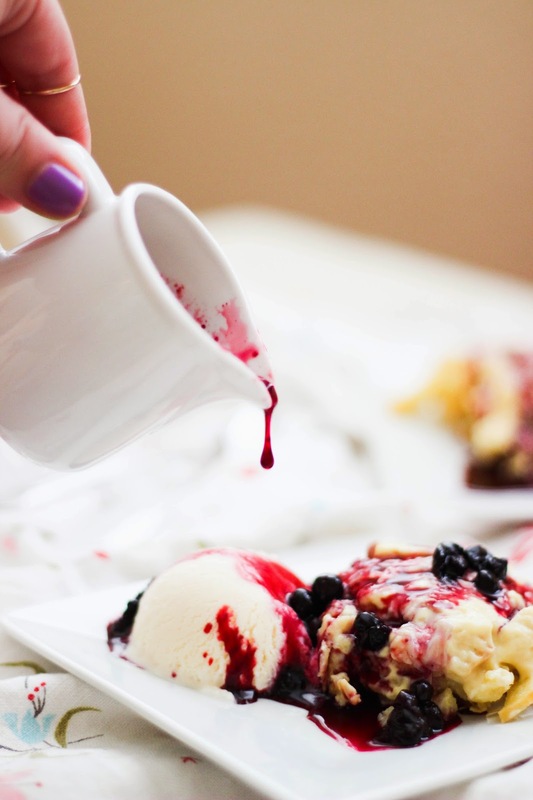 this really adds a lot to the dessert and it's super easy. 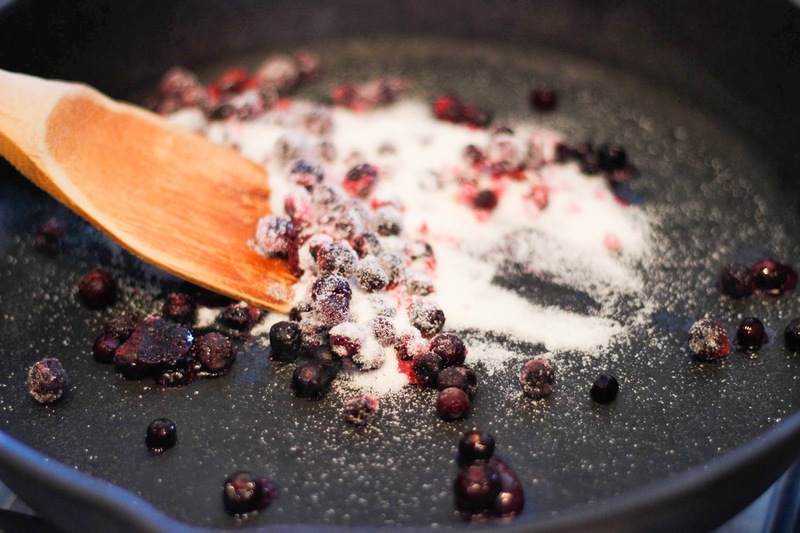 all you need to do is add 1/2 cup of fruit (fresh or frozen) and 1/4 cup sugar to a saucepan and heat it over medium heat until it becomes syrupy and the fruit softens. and that's that! 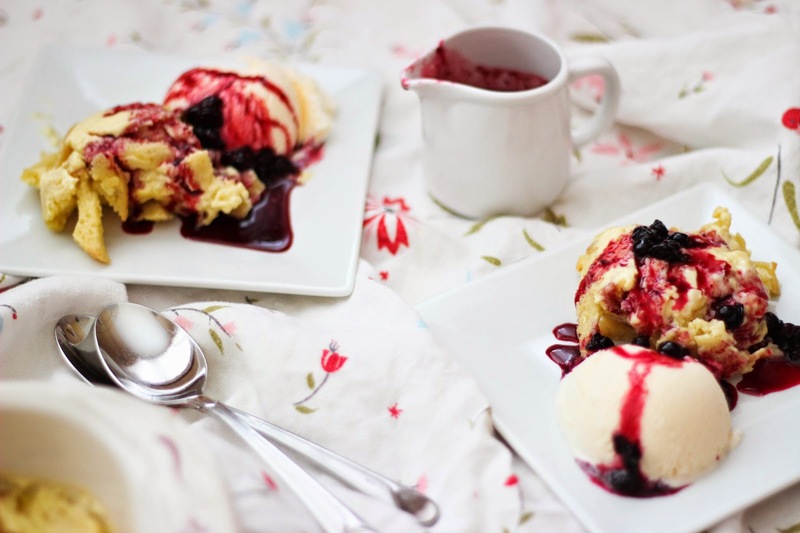 once your bread pudding is cooled, serve it up with a scoop of vanilla ice cream and a heavy pour of huckleberry sauce. oh dayum. Oh deliciously evil, evil deliciousness....I wish I had not seen this. It's too perfect.